Cefotaxime (Abbott/Sanofi-Aventis’ Claforan, generics) is a third-generation, parenteral cephalosporin available for IV or intramuscular (IM) administration. 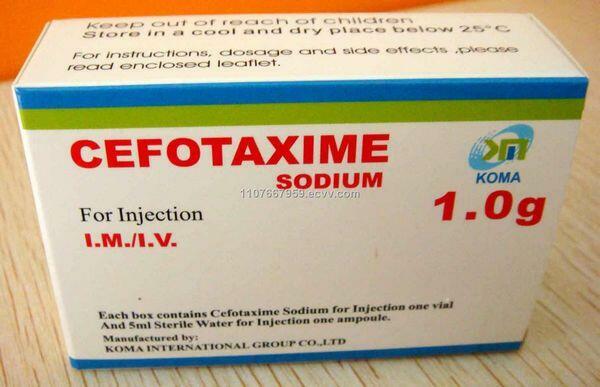 Cefotaxime was first marketed in 1981 in the United States, where generic versions of the injection are now available. The agent is also marketed by Roche in Japan. Cefotaxime is indicated for the treatment of lower respiratory tract infections caused by S. pneumoniae and other streptococci, E. coli, K. pneumoniae and other Klebsiella species, H. influenzae (including ampicillin-resistant strains). Cefotaxime is stable in the presence of many β-lactamase enzymes, which effectively extends its spectrum of activity against a number of gram-positive and gram-negative bacteria that are resistant to penicillins and other cephalosporins. Clinical and laboratory studies have demonstrated the activity of cefotaxime against S. pneumoniae and other streptococci. Gram-negative species susceptible to cefotaxime include E. coli, H. influenzae, H. parainfluenzae, K. pneumoniae, and others. An early clinical trial examined the efficacy of cefotaxime in treating patients with severe respiratory infections including acute exacerbations of chronic bronchitis and pneumonia. One hundred and ninety patients treated with 2.25-3.0 g of cefotaxime daily for an average of nine days displayed a favorable clinical response in 91% of 184 evaluable cases. Another randomized, double-blind, comparative clinical trial evaluated cefodizime (Fujisawa’s Timecef/Sanofi-Aventis’s Modivid), a third-generation cephalosporin, and cefotaxime in cases of acute exacerbations of chronic bronchitis. One hundred and eighty hospitalized patients were treated twice daily for seven days with 1 g IM injections of either antibiotic. Bacteriological efficacy was demonstrated in 98.9% of cefodizime patients and in 95.6% of cefotaxime patients. Cefotaxime is generally well tolerated, but some adverse reactions have been documented, including local inflammation at point of IV administration (4.3%) and GI disturbances (1.4%). Systemic adverse reactions to cefotaxime have been rare. Owing to its once-daily dosing, excellent potency, and spectrum of action, ceftriaxone (Roche’s Rocephin, generics) is one of the most successful antibiotics on the market. The agent, first launched in 1982, is a semisynthetic, third-generation, parenteral cephalosporin available for IV or IM administration. 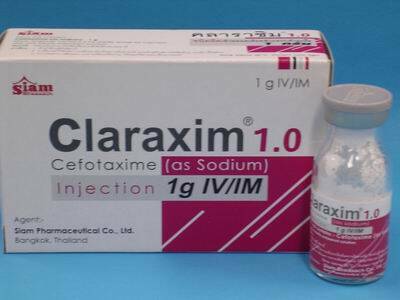 Ceftriaxone has been available generically in Europe since 2002. In 2000, Cubist Pharmaceuticals announced that it had acquired the rights to oral ceftriaxone and was developing an oral alternative formulation. However, the company discontinued development in 2004 after human clinical trials showed highly variable bioavailability. Ceftriaxone is indicated for lower respiratory tract infections caused by S. pneumoniae,H. influenzae, H. parainfluenzae, and K. pneumoniae. Ceftriaxone has demonstrated a broad spectrum of activity against gram-positive and gram-negative bacteria including S. pneumoniae, H. influenzae, H. parainfluenzae, K. pneumoniae, M. catarrhalis, and others. The efficacy of ceftriaxone in the treatment of lower respiratory tract infections was evaluated in a Phase III clinical study in 118 patients comparing either 1 gm of ceftriaxone or 1 gm cefonicid (GlaxoSmithKline’s Monocid), a second-generation cephalosporin, intravenously or intramuscularly, daily for 3 to 11 days (mean was 7 days). Clinical cure or improvement was noted in 93% and 95% of the patients treated with ceftriaxone and cefonicid, respectively. Bacteriologic cure or improvement was noted in 81% and 69% of cases, respectively. The agent is well tolerated in extensive clinical use, but local reactions have been reported.